Can you confirm these amateur observations of Trapelus mutabilis? pallidus: Egypt, Sinai, Syria, Israel, Jordan; Type locality: “Ober-Ägypten”. poppeki: Libya; Type locality: Libya: east of Tarbu, 24.48.27°N, 16°19’11’’E, 490 m elevation. Types Neotype: ZFMK 64395: Egypt, 10 km northwest of Cairo; leg. Hans-Werner Herrmann, 1990. Diagnosis Diagnosis (genus). Tympanum small, diameter less than half of the orbit, deeply sunk. Head usually rather high than short. Caudal scales not forming distinct annuli. Only males with callous precloacal scales. Diagnosis (mutabilis). Iapelus mutabilis is a small [largest voucher from Egypt SVL 90 mm (Baha el Din, 2006)] species within the genus, possessing irregular dorsal scalation. This species differs from its probable closest relative, T. pallidus, in having a heterogeneous dorsal scalation with rhomboidal and scattered enlarged scales. In contrast, T. pallidus has a matrix of com- paratively uniform, smooth dorsal scales, with some scattered larger keeled scales. In addition, T. muta- bilis differs from T. pallidus in having homogeneous scalation on the hindlimbs and base of the tail. Coloration in life is uniformly sandy grey with four to five transverse bands and a barred tail. Male T. mutabilis have nuptial coloration of violet-blue flanks and throat; in contrast male T. pallidus coloration is restricted to having a completely blue head. Trapelus mutabilis differs from two specimens from Libya in not possessing scale rows of enlarged verte- bral scales (for details see description in WAGNER et al. 2011). Trapelus mutabilis differs from T. savignii in having smooth ventral scales and no gular pouch, from T. schmitzi in having heterogeneous dorsal scalation and from T. tournevillei in having a shorter tail (average of ratio TL/SVL 1.39 in T. mutabilis instead of 1.60 in T. tournevillei), no gular pouch, a heterogenous dorsal sca- lation, and the lack of longitudinal stripes on the belly [from WAGNER et al. 2011]. Diagnosis (pallidus): Small to medium-sized species of the genus with an average ratio TL/SVL of 1.1. Gular pouch absent. Ear opening more or less round, usually with a smooth margin, but often spiny scales are present. Dorsal scales small, equal in size, forming a matrix with intermixed larger scales. Ventral scales smooth. Trapelus mutabilis pallidus is distinct from the nominate form in possessing a higher count of scale rows around midbody and in having a matrix of uniform small dorsal scales with some intermixed larger scales. Diagnosis: A small to medium sized subspecies of T. mutabilis with all the t many other valid Trapelus species and T. m. mutabilis and T. m. pallidus in its typical body scalation of enlarged vertebral scales and much smaller lateral scales. Only T. savignii has a similar body scalation. A second characteristic is the small pineal scale, which is not much larger than the pineal organ. Trapelus m. poppeki ssp. nov. differs from valid African species of Trapelus: – T. savignii (type locality: Egypt) in not possessing a gular pouch, in having the ventral scales smooth and in a high genetic distance.ypical characteristics of the genus. Trapelus m. poppeki ssp. nov. differs from – T. m. mutabilis (type locality: Egypt) in possessing enlarged vertebral scales in comparison to much smaller scales on the flanks. – T. m. pallidus (type locality: southern Egypt) in possessing enlarged vertebral scales in comparison to much smaller scales on the flanks. 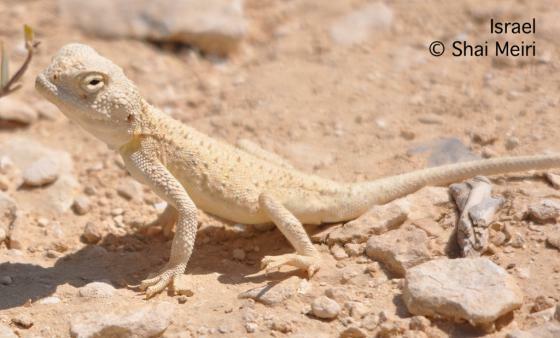 – T. tournevillei (type locality: Ouargla, Algeria) in having a shorter head, brownish trans- verse bands on the body, and smooth ventral scales (instead of keeled ventral scales in T. tournevillei) and in lacking longitudinal lines on the belly.– T. schmitzi (type locality: Ennedi Mts., Chad) in possessing a very heterogenous body scalation with enlarged vertebral scales and smaller lateral scales, and in having brownish transverse bands on the body. – Agama inermis Reuss, 1833 (type locality: southern Egypt) in possessing enlarged vertebral scales. – Agama gularis Reuss, 1833 (type locality: southern Egypt) in possessing enlarged vertebral scales. – Agama latastii Boulenger, 1885 (type locality: Egypt) in lacking equal sized, rhomboidal dorsal scales. 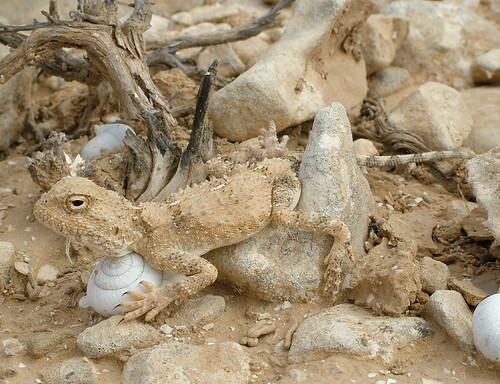 – Agama aspera F. Werner, 1893 (type locality: Alge- rian Sahara, between Kef-el-Dhor and Chegga; Biskra-Bordj-Saada; Zab-el-Zig south of El Mer- anyer) in possessing no spiny scales and a hetero- geneous dorsal scalation. Comment Synonymy: Possible synonymy between T. mutabilis and Agama pallida is discussed in Leviton et al. (1992) who list Trapelus pallidus as a separate species. 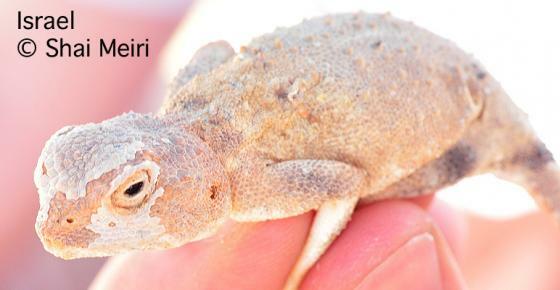 Synonymy: Agama pallida has been synonymized with Agama mutabilis by WERMUTH 1967 and others. Both “species” are very similar or identical. WERMUTH (1967) also listed Agama agnetae as synonym of Agama mutabilis. Synonymy mostly after WERMUTH 1967 and WAGNER et al. 2011. Type species: Agama mutabilis Merrem, 1820 is the type species of the genus Trapelus CUVIER 1817. Etymology Etymology (pallidus): Named after Latin “pallidus” = pale or yellow(ish).